I uploaded some of my jellyfish/chicken designs to my RedBubble page/store. I also uploaded two more photos. Unfortunately, they only seem to do full-colour prints, so the stencil-style design isn’t available in different colours prints (although I did upload dark and light versions). 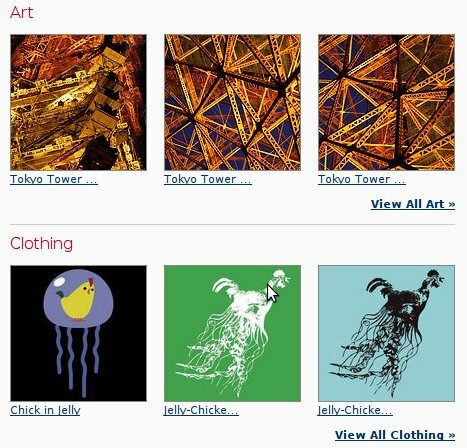 Author NickPosted on Saturday, 28 February, 2009 Saturday, 28 February, 2009 Categories GeneralLeave a comment on Jelly-chicken t-shirts for sale! After finding out about RedBubble via Bobostuff via Planet PIGMI, I decided to join and put some of photos, art, and t-shirt designs up for sale. I tried to take photos that capture and flatten a view such that it focusses on a plain background and elegant foreground pattern (like a Japanese print or craftwork). I think it would make an awesome large canvas print on the right wall. Rather than posting to both my RebBubble journal and this blog, I’m using FeedWordpress to automagically repost my RedBubble journal entries here. We should see if that works out real soon! Update: At the moment posts from my RedBubble journal seem to come up without any text (just the title). I need a better solution. and I loved the juxtaposition of the sort of instructional music that I remember from primary school with low-resolution bitmap imagery (something else I remember from when I was a child). I found that the video was generated by the Music Animation Machine. The homepage includes a basic history of the machine as well as a list of available videos online (or on DVD). It’s a beautiful thing. Well, for C programmers using (Ubuntu) GNU/Linux… similar instructions may apply for Windows development. Next steps: swfmill and Inkscape… maybe haxe. Surprise! Food that looks like a face! A few weeks ago, Heidi and I had a Swedish themed dinner party. This week we made some food for a “suprise theme” dinner party at a friend’s place in East Perth. The surprise theme was known only to the chefs and everyone else would have to guess what it was. I picked the theme, trying to choose someting that would be easy to satisfy and fairly obvious. Anyhow, the theme was “faces”! Author NickPosted on Tuesday, 17 February, 2009 Categories GeneralLeave a comment on Surprise! Food that looks like a face! Just saw Ghost Town starring Ricky Gervais (of The Office and Extras) and Tea Leoni. It was a very enjoyable film. The cast kept appropriate pacing and spot-on delivery of a script that could have easily been mishandled by a different director. It felt like a sophisticated (mature and dry) version of a peppy late 80s or angsty early 90s romantic comedy. Update: I just noticed that there is a fair amount in the trailer… that isn’t in the film… odd. I had a look at vgchartz this morning, and I was a little dismayed to see the Playstation 3 (PS3) sale numbers falling behind the Xbox 360 and (well behind) the Wii. The PS3 is my favourite current generation console; I really feel that Sony has generally got it right (which is something they aren’t really known for recently) from a consumer perspective. (There are many things they have done from a developer perspective, but I won’t go into that here). I don’t want people thinking that I am a subjective “fanboy“, so I should mention that I own all three current generation consoles and I never expected that the PS3 would be my favourite. The list of things I feel the Xbox360 has done wrong is much longer, and the list for the Wii is shorter but much more of a big deal to me (maximum resolution of 480p?!). Compared to the Xbox360: the PS3 has a built-in Blu-Ray (and DVD) player, it’s much quieter, it has a nicer user interface (try playing a bunch of videos one after the other on the Xbox36), and it connects wirelessly to my other devices (without a $149.95 add-on). Basically, Sony went for real (rather than perceived) value with the PS3. There is a higher entry price, but they don’t keep slogging you for money (with overpriced accessories, online gaming subscriptions, “points” that you can only buy in bulk, etc.). This is good for people (like me) who want a setup like the one above. Anyhow, I don’t want to lay the boot in too much. I’ve started learning Panda3D, the game engine behind Disney’s Toontown and Pirates of the Caribbean Online. I’ve been following Panda3D for a while, but never really gave it that much attention. I became more interested after reading the Toon Town post-mortem onm Gamasutra, epecially since they attributed a lot of their success to switching their scripting languages to Python. My initial thoughts are that it’s a fairly intuitive game engine for Python programmers. There’s no real toolset to speak of, but this isn’t necessarily a bad thing. It looks like the intended workflow is based on utilising existing tools (eg. 3D Studio, Photoshop) and small exporters or converter scripts. Which makes sense; no point trying to make artists learn new tools. I’ll post more thoughts as I get more experience with it.